The Weldr project is made up of several components. This can make it difficult for curious users to explore its capabilities without spending a bunch of time setting up requirements. Docker can make this process easier (assuming that you already have docker setup and running on your system). Weldr is currently a work in progress, with 2 main branches of development joined together by a common web interface – Welder Web running as a Cockpit plugin. One branch is focusing on upstream work using our own content store and depsolving(bdcs), and the other branch is being developed for CentOS7 using a modified version of the Lorax project called Lorax Composer. In this post I will cover using the Lorax Composer API server on CentOS7. A future post will describe the upstream API server bdcs-api. sudo docker build -t weldr/centos7-composer . You should now be able to connect to port 9090 of the docker container with your web browser, login as root using the default password from the Dockerfile (ChangeThisLamePassword). Click on the ‘Welder’ tab to see the list of recipes and select one to view. Initial population of the components may take a second or two while yum updates its metadata. Explore the interface, some of it is still hard-coded, but you can create, edit, save, and delete recipes. Select components to get more information about them, and add or remove them from the recipe. The current release does not allow you to build images yet, and some parts of the user interface are static, but the recipe items should all be working. If you take a look at the Dockerfile you will see that, other than the basic packages needed for a CentOS7 container, 3 other packages are being installed. cockpit is part of the CentOS7 distribution and it provides a nice web interface for managing your system. welder-web is actually a stand-alone web application that has been slightly modified to work as a Cockpit plugin. The bulk of the work is handled by lorax-composer which implements the API server that Welder Web communicates with. Cockpit handles proxying communication between the web browser and the API so that only the Cockpit port needs to be open on the host. One part of the API is recipe storage. Recipes are used to describe which packages will be included in the image being created, and they are stored in git on the backend so that changes can be easily tracked and reverted. One of the primary differences between lorax-composer and bdcs-api is that the depsolving in handled by yum instead of by bdcs. Currently it uses the yum repositories setup on the host for this. But in a future release the user will be able to add their own. 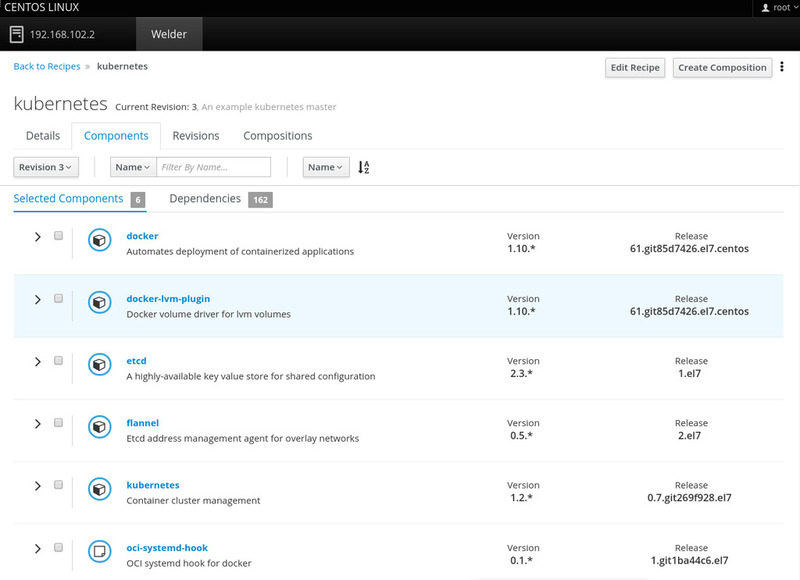 Weldr is still a work in progress, and this Dockerfile should make it easier for you to keep track of development. Check the repository for updates and rerun the build steps to see what improvements have been made.